As the festive period approaches, you will no doubt have an ever increasingly busy diary. Celebrations, shopping trips you name it.....it's on the list. 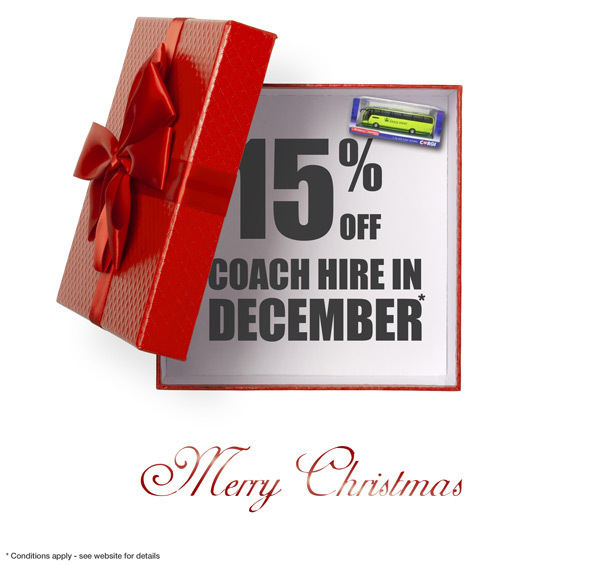 Well there is no need to shop around for your transport because, as a way of wishing you a Merry Christmas, The Kings Ferry will be giving you 15% off any hire travelling in December 2014! So if your business has a christmas party, or you're planning a day trip to a christmas market in France - Whatever the reason, don't hesitate to call or submit your details online. The Kings Ferry are a multi-award winning coach operator, most recently voted 'TOP LARGE COACH OPERATOR' at this years Route One Awards. Be safe in the knowledge you are in safe hands travelling on one of our luxury executive coaches. The Kings Ferry will provide 15% discount for any hire travelling in December 2014. Open to customers who haven't booked within the last 12 months. Excludes contracted customers. To claim your discount please quote 'We three Kings' when enquiring. If you are submitting an online quote request please place 'We three Kings' in the field titled 'Any other information'. 4th November 2014 marked the beginning of the second year of the new North Bristol Commuter Coach Service. To celebrate our 1st Anniversary of successfully running a brand new service from Weston-super-Mare, Clevedon and Portishead to North Bristol, Operations Manager Mark Purchase poses with Cllr Elfan Ap Rees with a wonderful Kings Ferry coach cake in front of our anniversary rosette. In the service's 1st year we have seen over 23,000 passenger journeys and over 800 registered customers enjoy commuting in complete comfort on-board our executive coaches with WiFi and reclining seats. After and independent survey result of 100% customer satisfaction it's not hard to see why it's going from strength to strength. To top the celebrations off The Kings Ferry along with North Somerset Council and Volvo won 'Partnership of the Year 2014' at the Route One Awards in the same week. The success of the service shows that this 1st year was one of many more to come - people can be safe in the knowledge that The Kings Ferry are here to stay in North Somerset. It was a successful night for The Kings Ferry at the annual Route One Awards, coming home with 2 top accolades. Crowned UK Coach Operator of the Year 2014, The Kings Ferry were eager to complete the collection by triumphing at this year's Route One Awards. Finalists in 3 categories - Manager of the Year, Partnership of the Year and Top Large Coach Operator meant The Kings Ferry could make it 5 awards in one year if successful in all 3. In fact The Kings Ferry, alongside North Somerset Council and Volvo won the Partnership of the Year Award for the ever growing coach commuter service into North Bristol, run by The Kings Ferry, funded by North Somerset Council and supported by Volvo. The Top Large Coach Operator Award finalists were The Kings Ferry, Lucketts Coaches and Shearings Holidays. Each great operators in their own right but with record figures and 100% customer satisfaction scores The Kings Ferry took the award to be crowned Top Large Coach Operator and UK Coach Operator of the Year in the same year.